The Egotists’ Club is one of the most genial places in London. It is a place to which you may go when you want to tell that odd dream you had last night, or to announce what a good dentist you have discovered. You can write letters there if you like, and have the temperament of a Jane Austen, for there is no silence room, and it would be a breach of club manners to appear busy or absorbed when another member addresses you. Somehow, the idea of announcing one’s dentist, of all things, captured my imagination the most. – Yesterday I bought a MacBook Pro. Not without trepidation, mind, as I have always been a PC user. But after my beloved Samsung fried, and my far-less-beloved Asus came to have an inoperable wireless card and tracked poorly…well, I basically went without a home computer for a year, using my smartphone instead, and growing steadily more frustrated by my lack of keyboard. The new model glows with promise: the promise that updates will not overwhelm me, that I need not pay a subscription to store my own documents, that I might go forth to join others in sub-creation. – Not unrelatedly, having obtained the equipment to do it, I have started learning about the nuts and bolts of coding in HTML. My programming brother recommended this course of action to me, and it is perhaps the closest a Muggle gets to reading a book of spells: when you assemble the necessary elements (be they ever so boilerplate) and press “Run,” behold! These curious ciphers and characters LIVE! If you did it properly, anyway. – I have been getting so much delight from the Ann Arbor District Library Summer Game. But that’s a whole other blog post, it turns out! – The people around me have reminded me of delightful things. My flatmate reminded me of how delightful Brideshead Revisited is, by preparing a picnic for us to eat on the solstice while reading excerpts of “Et in Arcadia Ego.” Emily reminded me about that most adorable composition tool, Written? Kitten! Katherine and Ike, friends from Hillsdale that I hadn’t seen since 2012, drove through the UP before meeting me in Lansing for lunch and a good few hours of catching-up. There have been other delights this summer – volunteer dill, stars-and-stripes pie for Independence Day, reading Gaudy Night aloud, brunch at Aventura, the 20th anniversary of Harry Potter coming out, revisiting The Great British Bakeoff, and watching The Tempest in the Arboretum. Truly, these be joyful days! Call the city when you see a water main break. Use a tape measure beforehand to be sure the furniture/ item will fit. Learn how to type (this one not by example, but by making each of us kids practice 5 minutes with FastType for every 20 minutes of computer games). There’s no such thing as a garment with too many pockets (this by the example of having our mother add a second breast pocket to several of his shirts). There’s also no such thing as too many flashlights. Try to buy American when you can. Wear shoes in places like the garage or the basement, where there might be nails or live wires afoot. “Don’t watch the ads, children.” Also: look away from violent TV shows. Don’t put the television in the middle of family life; if you must have one, keep it in the basement. “If you borrow a woodsman’s axe, you are borrowing his livelihood. If you borrow my pen, you’re borrowing my livelihood. So make sure to return the pen to my hand, where you got it.” The same goes for his Swiss army knife. “What have you learned from this?” Usually asked at the very moment we realized that a bad situation was at least partly our own fault. I’ve recently come to appreciate that it isn’t always the case that a man with three sons and one daughter treat them alike in dignity. From the time I was young, Dad told me that I could be at the top of the class or be the “head of the company.” Thus Dad taught me that, though I am different from my brothers, neither my thoughts nor my person are worth less than they are. He taught me that memorization of Scripture is important; invoices are also important; writing the date on things is useful; the items you own require maintenance; the items you buy represent a certain amount of time invested to earn the money so be sure it’s worth it; and that strawberries demonstrate that our God loves making beautiful things. Last November, I went to visit my friend the Mead. That week was full of tea-drinking, book-reading, meal-sharing, and general delight. 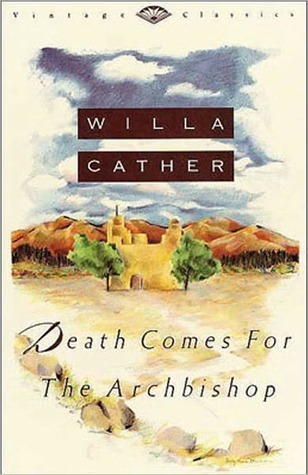 Among the books I read was Willa Cather’s Death Comes for the Archbishop. For years (and despite Melpomene writing about it, apparently), my impression of the book was that the title said everything about it: that somewhere, an archbishop (who knows where) lies sick and eventually dies. I had no idea how that could constitute an entire book, and figured it was puffed full of useless detail, ecclesiastical history that meant nothing to me, and maybe the fallout from the archbishop’s death. Then there came a point where a friend related a section of it: a corrupt priest uses his position to enslave the people living on a particular plateau, and they eventually revolted and killed him. I figured the whole book featured this corrupt priest, and the revolt was the book’s climax. Beautiful surroundings, the society of learned men, the charm of noble women, the graces of art, could not make up for the loss of those light-hearted mornings of the desert, for that wind that made one a boy again. He had noticed that this peculiar quality in the air of new countries vanished after they were tamed by man and made to bear harvests. Parts of Texas and Kansas that he had first known as open range had since been made into rich farming districts, and the air had quite lost that lightness, that dry, aromatic odour. The moisture of plowed land, the heaviness of labour and growth and grain-bearing, utterly destroyed it; one could breathe that only on the bright edges of the world, on the great grass plains or the sage-brush desert. The plot, per se, is somewhat loose; there is not one central event but in fact the tracing out of a man’s whole life: his journeys, his labours, his difficulties, his conversations. It is a life to make one glad.